Despite my borderline manic obsession with BSD on my own systems, I chose Ubuntu Linux on my mum's laptop, mostly because she just wanted a really basic system with a computer-illiterate-proof update mechanism, a web browser and that's it. So I was downloading it last night and glanced at the transfer rate. 2.2KiB per second? This was going to take longer than I thought. Until I read it again… 2.2MiB per second! 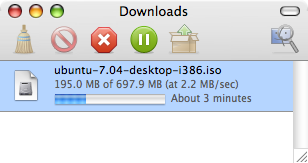 In less than 4 minutes I had the latest version of Ubuntu Linux sitting on my desktop, a 697MiB file! Compared to the internet I've used in Malaysia (argh TMnet!) and Australia (TPG is fairly reliable but slow), Singapore has it going on :). Newer post ← Netscape Navigator 9 rocks!